Barack Hussein Obama II is an American politician and the 44th President of the United States. He is the first African American to be elected to that office and the first president born outside the contiguous United States. 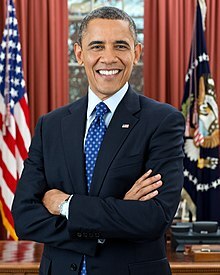 Born in Honolulu, Hawaii, Obama is a graduate of Columbia University and Harvard Law School, where he was president of the Harvard Law Review. He was a community organizer in Chicago before earning his law degree. He worked as a civil rights attorney and taught constitutional law at the University of Chicago Law School from 1992 to 2004. While serving three terms representing the 13th District in the Illinois Senate from 1997 to 2004, he ran unsuccessfully in the Democratic primary for the United States House of Representatives in 2000 against incumbent Bobby Rush. Barack Hussein Obama II ( /bəˈrɑːk huːˈseɪn oʊˈbɑːmə/ bə-RAHK hoo-SAYN oh-BAH-mə; born August 4, 1961) is an American politician and the 44th President of the United States. He is the first African American to be elected to that office and the first president born outside the contiguous United States. Born in Honolulu, Hawaii, Obama is a graduate of Columbia University and Harvard Law School, where he was president of the Harvard Law Review. He was a community organizer in Chicago before earning his law degree. He worked as a civil rights attorney and taught constitutional law at the University of Chicago Law School from 1992 to 2004. While serving three terms representing the 13th District in the Illinois Senate from 1997 to 2004, he ran unsuccessfully in the Democratic primary for the United States House of Representatives in 2000 against incumbent Bobby Rush.